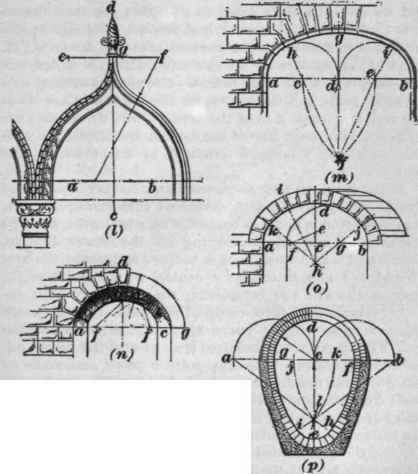 The general forms of arches are semicircular, segmental, pointed, elliptical, etc., the name being determined by the curve of the intra-dos, or inner curve of the arch. The outer curvr is termed the ixtra-dos. The soffit is the concave surface of the arch. 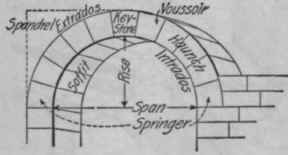 Vout-soirs or ringstones are the pieces composing the arch, the center or highest stone being termed the keystone or key-block. The first courses at each side are called springers, except in the case of segmental arches, in which they are termed skewbacks. The voussoirs between the skewbacks or springing stones and the keystone collectively form the flanks or haunches, and the spandrels are those portions of the wall above the haunches and below a horizontal line through the crown of the extrados. See Fig. 20. The span is the horizontal distance between jambs, and the perpendicular distance from the springing line to the highest part, or crown, of the soffit is the rise. The joints of circular and segmental arches radiate from a single center. In arches having two or more centers, the joints in each arc of the curve radiate from their respective centers. The joints of elliptic arches are found thus: Draw lines from each of the several points (spaced off on the intra-dos or extrados) to the foci, as shown at (n), Fig. 21; bisect the angles thus formed, and the bisecting lines will give the direction of the joints. The joints in flat arches are drawn from the vertex of an equilateral triangle having the springing line as a base. At (a), Fig. 21, is shown a semicircular arch, of which a b is the springing line and cd the rise. At (b) is shown a segmental arch; the center a is taken on the line ab, which bisects the span cd. The radius of this arch equals approximately the square of the span divided by eight times the rise. For exact formula, see Sector, page 37. At (c) is shown a Moorish, or horseshoe, arch, the springing line ab being below the center from which the curve is struck, making a sweep of about 230 degrees. A similar form is the pointed Moorish arch, differing from (c) only above the line c d, above which it takes the form of a two-centered or pointed arch. These two arches are called stilted arches, from -the fact that the center is raised above the springing line. Another example of stilted arch is shown at (d), in which the arch centers are on the line a b, and the springing line c d is below it. At (e) is shown a flat arch built of wedge-shaped voussoirs, together serving as a lintel; the joints radiate from a center at the vertex of an equilateral triangle of which the span is one side. 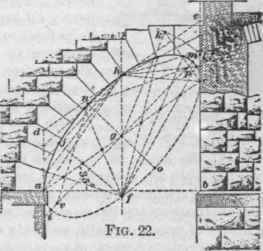 At (f) is represented a brick relieving arch a b c, intended to carry the weight of the wall above; by this construction the lintel d merely sustains its own weight and that of the small brick segment e.
Fig. 21. (b.) a b produced. Then, with f as center and a radius/a, one side of the arch may be drawn, the other half being similarly found. At (j) and (k) are shown examples of four-centered Gothic, commonly called Tudor, arches. At (j) is represented an arch in which the given span a 6 is divided into six equal parts, as at c, d, e, etc. To find the centers for the longer radii, with c and e as centers, and a radius ce, describe arcs intersecting at f; draw fc and fe, and produce these lines to g, h, i, and j; the last two points will be the required centers. With c and e as centers, and a radius c a, describe arcs ag and bh; with i and j as centers, and a radius ih, describe the arcs h k and g k.
At (k) is shown an arch of similar construction, but the span a b is divided into four equal parts. The distances a c and bd are each made equal to a b; lines are then drawn from c and d through e and f, and produced to g and h ; the arcs are then struck in a manner similar to that shown at (j ). At (I) is represented an ogee arch, which is stilted one part in seven of the total height. The span is divided into six equal parts, and the centers for the lower arcs are taken at a and b, at each side of the center line c d; the arcs are tangent on the outer line of the molded architrave, the position of e and f being determined by the width of the neck at g.
At (m) is shown a three-centered arch having the span a b given. To lay out this arch, divide ab into four equal parts, as at c d e; from a and b as centers, with a radius a e, describe the arcs ef and cf, intersecting on the center line fg. From c and e as centers, with a radius c a, describe the arcs a h and bi; and from f as a center, with the radius fh, describe the arc h g i, completing the figure. At (o) is shown a three-centered skew arch, which closely approaches an elliptic curve in form. To construct the arch, having given the required span a b and the height c d, proceed as follows: Take any point e on c d, and make a f and gb equal to ed. Draw fe, and bisect this line by the line h i, cutting the center line d c at h. Draw hfk and h gj: with f and g as centers, draw the arcs a k and bj and with h as a center, draw the arc kdj. 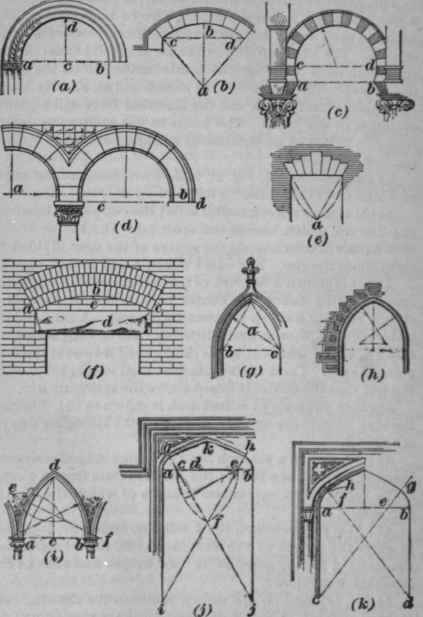 To construct a rampant arch (such as is used for carrying a flight of stone steps), as shown in Fig. 22, the base line a b and the angle of inclination being given, draw a b to the required length, and at a lay off the angle of inclination; draw the line a c; bisect it, and at the points a, b, and c erect the lines ad,b e, and fg h, each perpendicular to a b. Now, through h - a point on the under side of the arch determined by the thickness required for the step backing and voussoirs - draw a line d e parallel to a c, completing the rhomboid adec. Divide the line ac into any number of equal parts, and divide a d and c e into one-half as many equal parts. From h draw lines to the points on ad and ce just found; make gf equal to g h, and from f draw lines through the points on the line a c, producing them to intersect those first drawn, as at j, etc. These points then will be on the required curve, which may be readily traced through them. To locate the axes and foci of the ellipse, erect ck perpendicular to a c at c, and make it equal in length to g h. With g as a center, and a radius g k, describe an arc intersecting e c at I; a line drawn from I through the center g will give i m as the major axis; and n o, perpendicular to it at g, will be the minor axis. Taking the distance g m as the radius, and with n as the center, describe arcs cutting the major axis at v and p; these points will be the foci of the ellipse, and, after marking the thickness of the joints on the intrados, the joint lines may be drawn as explained for (n), Fig. 21.